There’s a reason Lego is the most popular toy on earth. Not only does it inspire and foster kids’ imaginations, it can also be used as a valuable teaching tool as the company’s new WeDo 2.0 robitics and coding kits demonstrate. 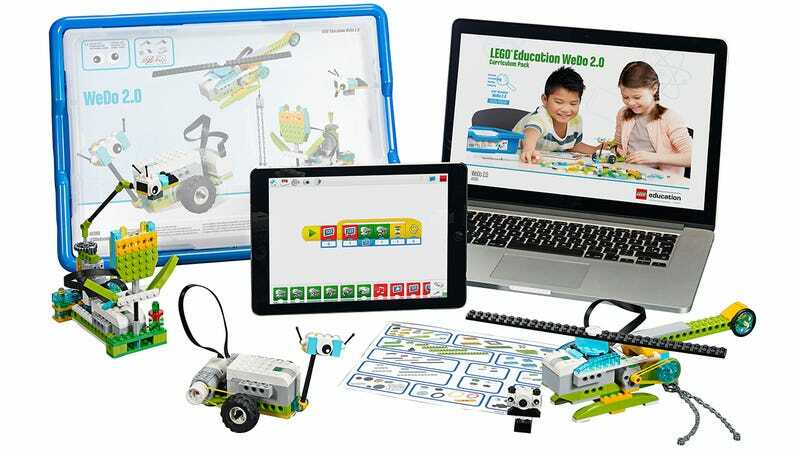 Designed for children at the elementary school level—although adults will surely get just as much enjoyment from the kits—the WeDo 2.0 is a sort of stripped-down version of the Lego Mindstorms EV3 set. It’s built around a Bluetooth-enabled Smarthub element that controls and powers a motor, a tilt sensor, and a motion sensor. It also talks to a simplified graphical programming app running on a wirelessly connected tablet or laptop. The Lego WeDo2.0 kit includes about 40 hours of simple robotics projects that introduce kids to basic scientific concepts like engineering, physics, and coding. But by teaching those concepts through a toy that kids almost certainly grew up with, the topics will seem less daunting and—dare we say—maybe even fun. Available now supporting iOS, Android, as well as Mac and Windows computers, Lego’s WeDo 2.0 kit is another step towards getting kids excited about a possible career in the sciences. Not that the world doesn’t need more professional athletes or actors, it’s just important for kids to realize that other careers aren’t necessarily as boring as they’re often made out to be. Now if only we could find a way to make Shakespeare less boring through Legos.